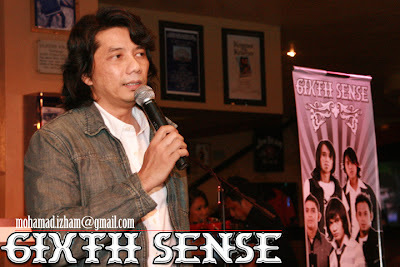 I was invited (THANX TO BUDIEY) to the launching of the album of this new group, the 6ixth Sense. So I went to KL, Awin picked me up and rushed me there. As I was allowed to bring anyone there, I asked her to join me as I actually knows nobody there accept if Budiey of Sensari Selebriti is coming as well. We arrived so early, as early as 2.30 so our name was the first and second on the guest book. Then, there were people coming and introduced themselves to us and so so so on. Suddenly I saw one familiar face. 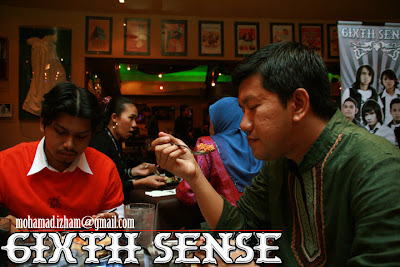 He's actually Mujahid, a friend of mine, who likes sisha so much and he is also the manager of The 6ixth Sense as well. Damn!!!! After waiting for quite sometimes, then only they provide us with the food. I was hungry but at the same time I was nervous. How am I gonna shoot pictures in this place? So as people rushed to the food provided I took test pictures. 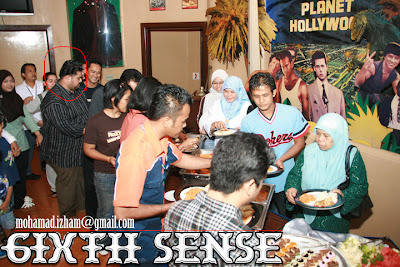 The one circled in red is Mr. Mujahid, The 6ixth Sense's Manager. Thank god Budiey came to the function so at least I have people around to talk with. I was so excited with people I knew around and we were chatting non stop (you know me sometimes when I got too excited, I can be a non stop talking parrot). In front of me is Faidi (correct me if I'm wrong). This the Metadome Sdn. Bhd. 's manager, Mr. Ferhard. Sounds like the singer Ferhad but ok la, he looks like a rock rock person too. That appearance just suit what he's doing. 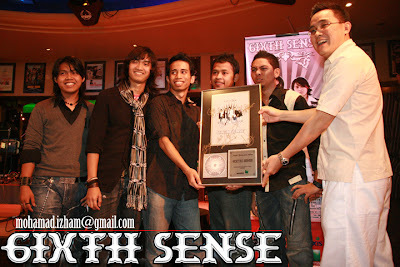 So this is the album launching ceremony. I don't know who the hell is that guy with the spectacle and white pants. 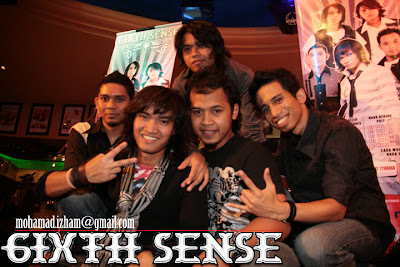 Well, this is a local group with an Indonesian vocalist, with was has brought some controvercial issues of are we lacking of local talents but who cares? This is such a good combination with quite an interesting marketing strategy for both Malaysian and Indonesian market. They're quite optimist by being the first artist to venture into digital music market. It's quite an open to high risk venture but this is just the necessary in order to make use of the techs. We should wait and see. Now music is not just about making albums, it's about how the artist is being marketed. Music royalty is still quite an issue but it has to be taken cared with a highly detailed concern on the implementations. The waited performance is a bomb, it's just that, the song are too new and it seems to me that out of that 5 performed songs, none were ear-catching to me. There are rooms to improvisation but the singer is quite able to manage the stage greatly. Well done! So this is a special post just for my camera. You guys can take this print out for an A4 print. Just crop it to 4:5 ratio and done. The one that blinked his eyes is BOB, my uncle. 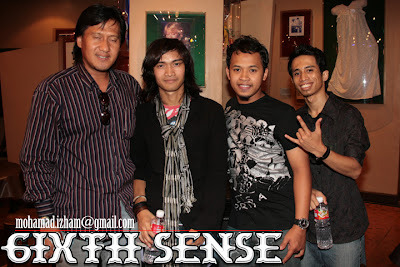 I knew Mujahid through him and he's also was somekind of involved in grooming of this band and together we pray that this group will someday will grow, up to some level that we can be proud of. 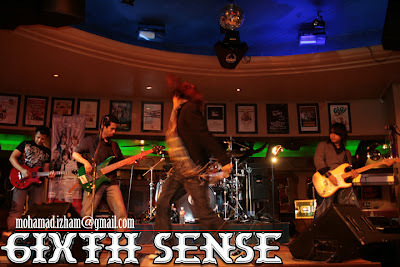 hope u enjoy dengan muzik segar dari 6ixth Sense ya. 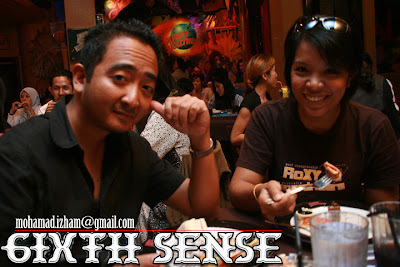 sixth sense? suara sengau je aku dengar. dah la lagu hit dia hari tu lagu lama yang di barukan. hampeh! Where have I been huh?